Can anyone help me find information on this abandoned Harjo school? I played here some 30 plus years ago as a kid, and it was abandoned even then. However, I think it may have been used for some non-school uses since that time. When we were kids, we had heard it was an Indian school. I have done internet searches for it and cannot find much other than a few photos of the gym from a couple years ago and a realtor who actually had it listed for sale a few years ago. 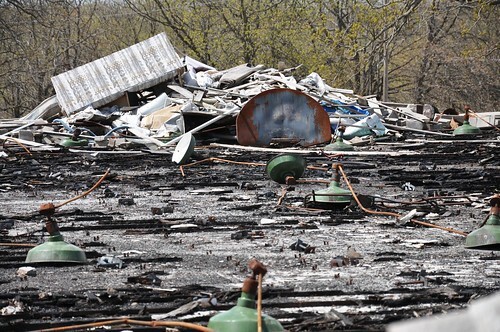 Most of the 6 or so buildings are in bad shape, and the old gym I roller skated in as a kid has burned down. The ceiling lights and basketball goals lay exactly where they fell. I did not venture any farther inside the main school building than the front door due to improper UE attire. Flip flops are probably not recommended! The main building looks actually to be in decent shape other than some windows knocked out. The front door is completely unlocked. I would love to go back and do a more in depth UE of the main building. If anyone has access to more information on the history of this school, I would love to know it. 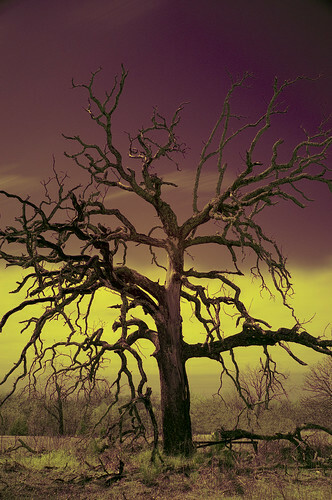 On a side note, I took this experimental shot below in this same school yard of a creepy tree with an Infrared Filter. I thought it turned out pretty cool! Off hand I don't know anything about it.. but I, and I am sure the other guys, will definitely take a look into it man! Cool tree shot too by the way! Awesome tree shot! It's creepy & beautiful at the same time. Yeah go back for more pics. Alot of times the is no info to be found on some structures. It might help to go talk to some of the towns people & see if you can get a story. Tree shot is amazing! Looks so fake that it has to be real haha. I'll see what I can dig up on that school. Ok, so the only info I have found so far is that it was used as a camp, called "Harjo Hills Camp". Wow thanks for the replies! When I was a kid and played there, the only building being used was the gymnasium, and only a few days during the summer when we would all go and roller skate. I suppose that could have been put on by "Harjo Hills Camp" but I do not remember. I remember several indian children there during the roller skating. I am not Indian, but my best friend at the time was. We played around that school all the time as young kids and there was not a camp at all going on during most of the time. I remembered wondering at the time about the history of the school and why it was no longer a school. It seemed so run down and primitive compared to my big time school, Maud Elementary! Ha! Thanks again for the input and I appreciate any more info anyone has. I hope to go back and get some better photos inside the remaining buildings. this is that school wendi and i were talking about! I did find some information on it. 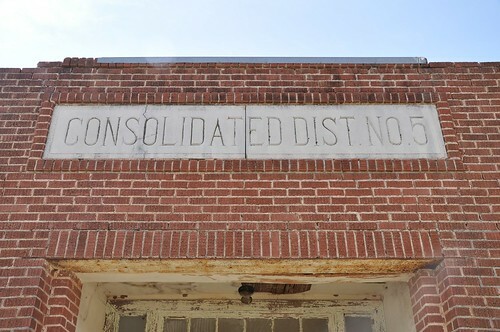 It was listed as a WPA school, built some time between 1936 and 1938, though according to the document, it may not be a WPA school, even though it is listed as one. From the obits the earliest graduate I found was 1939 and the last was 1959. I found a reference to Ruth Delorin Lucy, who was a cook at the school for 25 years so I thought I had you a lead, but she passed away in 2005 in Maud. Her son Paul Lucy is still living in Maud and may be a source for some information. This is a screencap of a PDF file containing a description of the school and its nomination as an Oklahoma landmark, though no date is given on the scanned document. It was still listed in the Seminole Producer for sale as of Fed 2, 2011. Check to see if there is a county historical society. Most of these are low budget and have no web presence, but a lot of good information and pictures stashed away. awesome!! thanks so much! we have only been able to find a little info on this school. 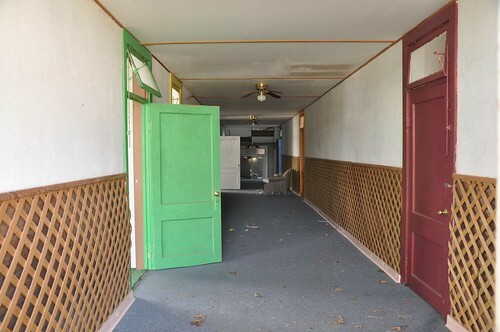 over the last few days, i was able to get some updated info on the property from the realtor who has the listing. There is a feature post on this school coming soon as the admin gets his arse in gear! can't wait to see the post!! wendi and i have been sitting on those pictures for months!! My family is from that area and I can tell you that my father attended Harjo School. In fact, he had a close friend who attended there with him named Billy Harjo. My father was born in 1923 out by the Old Rock Church on Fairview Road in Maud, OK. He and all of his brothers attended the Harjo School. Hi. My family and I attended this school. I was in the first grade. I believe there were 3 classes in one room. Lots of memories there. 2 of my aunts attended there in high school. My family and my grandparents and 2 aunts lived on an 80-acre lease in the country and rode the bus to school. Some of the families in the area were: Foughty, Patterson, Lamirand, Jett, Moon and many more that I cannot remember. Garland Lucy was our bus driver and his wife worked in the lunch room. We attended basketball games and other activities in the gymnasium. The lunches they served were prepared by mostly local ladies and the food was great. Used to frequent a local store in Harjo for soft drinks, etc. We used to pick pecans on the lease and bartered for staples in Tecumseh, Oklahoma. For more info, contact me or post here. kjlamirand@yahoo.com. Hi! My grandpa was the principal of this school for a while.. His name is Dale Smith.